Powerful and flexible digital mixing system, featuring 32 award-winning Midas Pro Series Microphone Preamps, 16 Assignable Buses and 6 Matrix Mixes. Combining outstanding audio quality and tremendous flexibility, the M32 also brings a comprehensive range of on-board effects, as well as remote control options. Option Slot fitted with DN32 32 Channel USB Interface Card. Supplied in Custom Flight Case with Dogbox and Castors. When hired with the Midas DL32, a 50M Tour Grade CAT5 Cable is included. 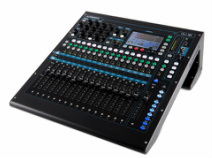 Compact, 16 channel digital mixing console packing in all the features you would expect from a professional desk, but in a compact, rack-mount size frame. The integrated “QuDrive” multitrack recorder lets you record 18 channels direct to a USB Hard Drive with no computer required. Qu-16 is a self contained mixer with local inputs and outputs, or a connection can be made via CAT5 to our Allen and Heath AR2412 Stagebox via CAT5. Supplied in a Custom Flightcase with Dogbox. When hired with the Allen and Heath AR2412, a 50M Tour Grade CAT5 Cable is included. Ideal for small events where complex EQ and routing is required, this mixer features four XLR mic inputs, four stereo inputs on quarter inch jacks, and a simple aux send function. Compact it may be, but it retains Soundcraft’s superb audio quality, with GB30 preamps lifted straight out of larger desks like the GB8. Perfect for when only a few channels are needed, but inputs are greater than the inbuilt mixer on one of our QSC K10 speakers can handle. ​3U Stagebox for Midas M32 Digital Console. Featuring 32 Midas Pro Series Mic Preamps, 16 Analogue XLR Outputs, 2 AES Outputs, and an Ultranet Bus, as well as twin ADAT Ports. Connection to the console is via AES50 CAT5, with an option for connecting either additional Stageboxes, or as a Digital Split to a second console. Also compatible with Behringer X32 Series consoles. Supplied in a Rack Case with LED Gooseneck Lighting. Stagebox for the Allen and Heath Qu-16, and also suitable for use with A&H Qu-24, Qu-32, Qu-Pac, Qu-SB, GLD80 and GLD112 consoles. It offers 24 XLR Inputs and 12 XLR Outputs, with connection to the console made using CAT5 Cable and Allen and Heath’s dSnake protocol. Further expansion is available by connection to an AR84 Expander, and the Monitor port is compatibile with both the A&H ME1 and Aviom A16 personal monitor systems.